Just moved into Koramangala? Or already own a pad in this part of town? There is always scope for some home improvement or to turn your new house into home. With our guide to home decor stores in this neighbourhood, all your needs – from pretty crockery to customised furniture and table linen to gorgeous lamps, ought to get taken care of. If you want to brighten up your back yard, then look out for Sunshine Boulevard’s range of garden furniture and accessories (we would grab their mosaic tables and pots). Add a spot of colour to the greenery with their yellow cycle pot holders and carved benches. No worries, if you want to quirk up the indoors too. They have splendid ceiling and table lamps, metal leaf candle holders, framed mirrors and so much more. While you are at it, go ahead and check out their stools and chairs that could spruce up your space. 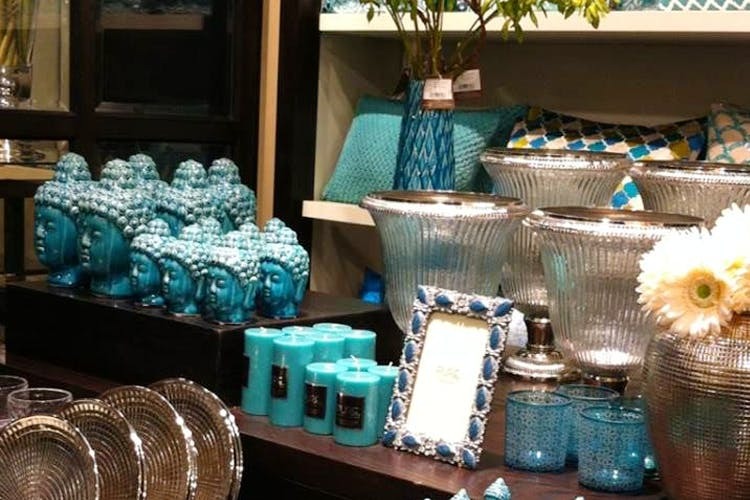 Already known for their earthy taste in fashion, Fabindia has an array of eco-friendly home decor pieces too. From bed and bath linen to floormats, colourful curtains, tableware (pick from ceramic cutlery, metallic glasses, vivid table mats and napkins) and cabinets (bar and dining room cabinets), you will be spoilt for choice by their collection. For a touch of elegance on your dining table, go for their Mangalgiri printed runners or the embroidered ones. Their cotton printed quilts can liven up your bedrooms. Always wanted a mini-library of your own? Then, stack up your books on the criss-cross bookrack or their L and T-shaped bookshelves lined with fabric. Not so confident on clashing prints on home decor? The Purple Pony lets you step out of your comfort zone and mix and match to your content. Quirk up your basic looking sofa by pairing it with their vibrant cushions. Their vintagesque arm chairs and the hand carved console tables are ideal for those who want to add some old world charm to your space. Complete the look by lighting up your rooms with their collection of canvas lights, table and ceiling lamps. Haven’t found the right fit for your home yet? Then head on to Wood And Wicker, where you can ask them to design and personalise furniture pieces to your accordance (besides, choosing from their existing collection). They will even visit your home to analyse and determine the perfect fit of furnishings for your abode. From beds and wardrobes to kitchen and outdoor furniture, made from wood sourced from all over the country and premium melamine coating and polishes, they have quite a lot to offer. We love their TV Cabinet with bookshelves on either side, which was part of one of their many projects. Mostly working with teak wood and veneer, they create wood works with intricate detailing.